If you're not familiar with edX, they have many informative and interesting free online courses. I came across one that really impresses me, and I'm sharing it with you! I'm providing the link to the course on edX, but you can also access it for free directly at the Linux Foundation. 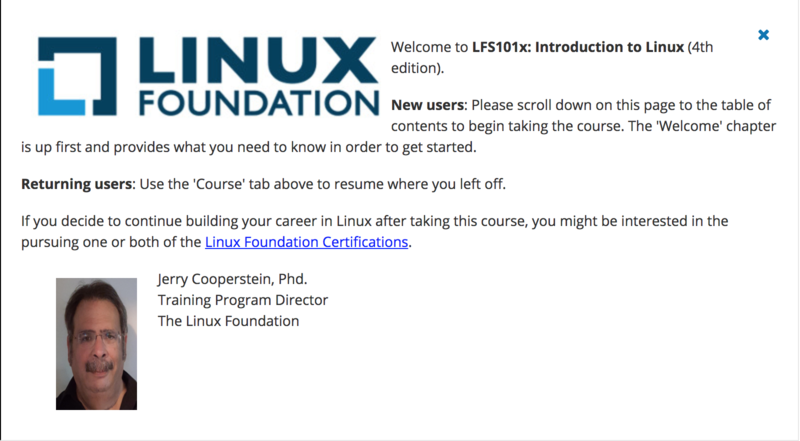 Just scroll down to LFS101, Introduction to Linux. I provide both, because I heard about it on edX, and I like edX, but if your focus is strictly on Linux learning, you may just want to go straight to the source. ... There are 10 more chapters. As you can see, a comprehensive introductory course. Update 15 Dec 2017 - I tried signing up through the Linux Foundation and the link referred me back to edX. Do you want to learn to hack and thereby how to defend web sites? Try the SANS Holiday Hack Challenge. Shout out to Jeff V. (@mrvaughan) for the tweet about this!